With the exception of California and Stanford who will play their rescheduled Big Game on December 1st, we are heading into the final weekend of the regular season. And we enter that final week on an uptick with a 5-0 result with last week’s picks, setting the season record at 57-23. A quick review of week twelve results and then on to a Saturday slate of rivalry games – two of which are of the non-conference variety. The Huskies clocked the Beavs with 28 first quarter points and were never threatened. Jake Browning and Myles Gaskins closed out their careers in fine fashion. Browning completed 17 of 23 for 242 yards and three touchdowns; Gaskins scored once, gaining 135 yards on 18 carries. Freshman Jamar Jefferson gained 115 yards on 19 carries for the Beavers. UCLA stormed back with 13 fourth quarter points, mostly on the shoulders of junior running Joshua Kelly. A transfer from UC-Davis, Kelly rushed for 289 yards and two touchdowns on forty carries. His 55-yard bolt early in the fourth quarter gave the Bruins the lead and UCLA tacked on a pair of field goals before USC quarterback J.T. Daniels’ incomplete pass ended the Trojans’ hopes on 4th and 3 at the UCLA 29 with 39 seconds remaining. For the first 30 minutes, the Buffs and the Utes were at a loggerhead, tied at seven when the teams lined up for the second half kickoff. After carving up the Oregon defense the week before, back-up quarterback Jason Shelley threw for 221 yards and a pair of touchdowns and the Utes put up a 17-spot in the third quarter to win the program’s first Pac-12 Southern Division championship. As for the Northern Division crown, it is Washington State in the driver’s seat with a TKO of the Wildcats in Tucson. The Cougars led 21-7 after one quarter and 55-14 at the half with Gardner Minshew throwing for 473 yards and seven touchdowns in the romp. Again for the Ducks it was a tale of two halves. With a 28-13 lead at the break, Oregon could only hold on for dear life as the offense stalled and the Sun Devils rallied back to have a chance to tie the game with 4:35 left in the game, but ASU quarterback Manny Wilkin’s pass on the two-point attempt was ruled to have been caught out of bounds. 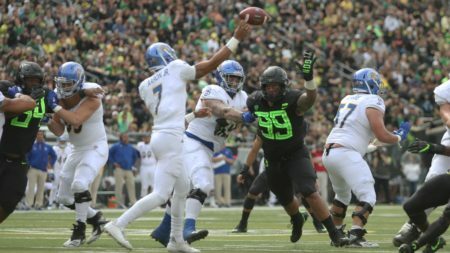 The Ducks had to dodge yet another bullet when Justin Herbert was intercepted on the Arizona State 46-yard line less than a minute later. Three plays into the drive linebacker La’Mar Winston Jr. stripped Wilkins of the ball and teammate Gus Cumberlander fell on the fumble to preserve the Oregon win. It may never rain at Autzen but it certainly seems to every other year at Reser… and it will again in 2018. A wet field makes for funny bounces and every coach enters a rivalry game with a trick play or two saved up just for the occasion, a combination that can often cloud up the crystal ball but not so much in this case. With Oregon’s clearly stated intent to run the football and the Beavers’ defensive liabilities in stopping the run, the weather may actually play into Oregon’s hand. If they don’t get careless with the ball, Oregon puts two halves of decent football together and heads back down Hwy 99 W with a 38-23 win. In the Palouse. With rain in the forecast and maybe snow. Cougars are favored by just less than a field goal but the odds makers are overlooking how effective Washington State is at keep the ball out of opposition hands. Quarterback Gardner Minshew has perfected the Mike Leach Air-Raid offense into not just a passing attack that maintains its ability to strike quickly but is now content to move the chains a chew up the clock. It is a formula that has worked nearly flawlessly so far and that won’t change on Friday. Washington State 44-21. The first Territorial Cup for both ASU’s Herm Edwards and Arizona’s Kevin Sumlin. The Sun Devils have been the more consistent team of the two and was in the running for the southern division championship until last week’s loss to Oregon. As impressive as the Wildcats were in dismantling Oregon two weeks back, Arizona was equally uninspiring in getting trashed last week by Washington State. Basically a pick ‘em game in Tucson although the nod goes to ASU by a bit more than that 47-38. In the aftermath of Colorado dismissing head coach Mike McIntyre after last week’s beat down at the hands of Utah, there isn’t much for the Buffs to be playing for. On the other side of the coin, Justin Wilcox has engineered a noteworthy second half turnaround for the Bears. After losing three straight games to open conference play, the Bears have knocked off Washington and USC and nearly upset Washington State over the last month of the season. Happy times in Strawberry Canyon … at least until Stanford shows up next Saturday. California 37-13.